Many genetic differences between humans and other great apes were not recognized earlier when their genomes were first compared. Orangutans, along with chimpanzees and gorillas, are among the great apes whose genomes are being compared with those of humans. New, higher-quality assemblies of great ape genomes have now been generated without the guidance of the human reference genome. The effort to reduce "humanizing" discovery bias in great ape genomes provides a clearer view of the genetic differences that arose as humans diverged from other primates. In the June 8 issue of Science, researchers report on improved orangutan and chimpanzee genomes that were built from scratch using long-read PacBio sequencing and long-range mapping technology. The highly contiguous, newly assembled genomes present a better resource for novel gene discovery and high-resolution comparative genomics amongst the great apes. The multi-institutional project, involving more than 40 scientists at a dozen research centers, was led by Zev N. Kronenberg and Evan Eichler, a Howard Hughes Medical Institute investigator in the Department of Genome Sciences at the University of Washington School of Medicine. Kronenberg is now a senior computational biologist at Phase Genomics. The scientists note that many of the genetic differences between humans and other apes were not recognized when their genomes were first compared. Areas of rapid structural change were still nebulous in those early draft genome assemblies. This made them difficult to compare and limited the discovery of the functional differences that distinguish humans from other apes. 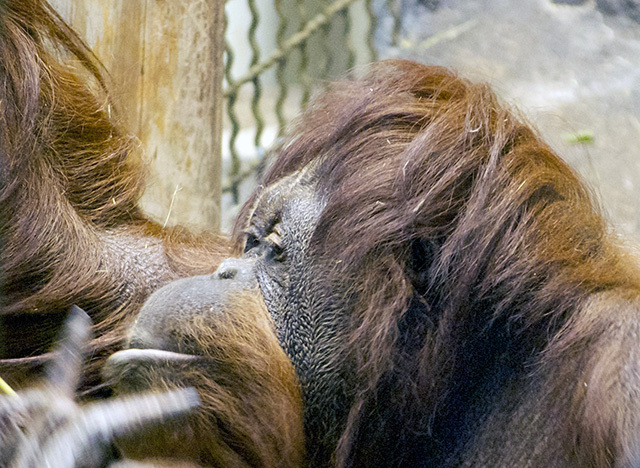 By coupling long-read sequence assembly with a hybrid genome scaffolding approach, the researchers resolved the majority of gaps in the ape genomes. Some of these gaps contained genes, which are now correctly annotated in the new genomes. To better understand the gene structures, the authors complemented this effort by sequencing more than 500,000 full-length genes from each species. The genetics of anatomical and dietary differences between humans and gorillas is one of many areas of comparative genome studies. The newest investigation provides the most comprehensive catalog of genetic variants that were gained or lost on different ape lineages. Some of these variants affect how genes are differentially expressed among humans and apes. The researchers examined the possible influence of some of the genetic variants and gene function regulators on such areas as human and ape dietary differences, anatomy, and brain formation. The research team's comparative analysis of human and great ape genomes also included a gorilla assembly, a new assembly of an African human genome, and a human haploid hydatidform mole assembly. (Because they contain only half of the paired human chromosomes, studies of these rare human growths help tell similar duplicated genes apart.) All the genomes were sequenced and assembled using the same process. Additionally, the researchers studied brain organoids - laboratory-grown tissues coaxed from stem cells of apes or humans and forming a simplified version of organ parts. These brain proxies were examined to try to understand how differences in gene expression during brain development in humans and chimps might account for chimps' smaller brain volume, which is three times less than human brain volume. There are also significant dissimilarities in cortical structures in human and chimp brains. The researchers observed in the organoids that certain genes, particularly those in cells that are like the progenitors of radial glial neurons, are down-regulated in humans compared to chimps. Those genes are more likely to have lost segments of DNA specifically in the human branch important in regulating their expression. The scientists said that this finding is consistent with a "less is more" hypothesis proposed in the 1990s by now-retired UW School of Medicine genome sciences professor Maynard Olson and his colleagues. The hypothesis proposes that the loss of functional elements contributes to critical aspects of human evolution. On the other hand, certain human genes appear to be linked to up-regulation for neural progenitors and excitatory neurons in the nervous system. These genes are more likely to have gained additional copies in the human species, compared to other apes, through a process of gene duplication. The researchers said that their recent findings fit with their previous studies showing that the genomes of the common ancestral lineage for African great apes likely underwent an expansion of segmental duplication more than 10 million years ago. These repeats of sections of the genetic code may have made great ape genomes particularly prone to deletion and duplication events, thereby accelerating the rate of mutations with major consequences that helped drive the evolution of ape species. A pair of western lowland gorillas. similar to present day retroviruses, that is thought to have been present in the genome of the common ancestor of all African apes. The high quality sequence helped identify the "source PtERV1," common to chimpanzees and gorillas. Modern day chimpanzees and gorillas carry hundreds of PtERV1 retroviral insertions that appear to have originated from this source that never made it into the human genome. The "source PtERV1" was overlooked in the earlier draft genomes because it mapped to repeat-rich gaps. In other aspects of this project, the comparison of the gorilla and human genome assemblies identified a new gorilla sequence inversion near an important gene that controls penile spine morphology, which humans lack. These small, skin surface bumps occur on apes and some other mammals. Humans also underwent the deletion of some genes involved in the synthesis of fatty acids. Some genetic changes related to dietary metabolism were identified in this project. These may have played a role relevant to the evolution of ape species. Great ape diets range from keeping strictly vegetarian to eating almost anything. The researchers on this study predict that more advanced, long-range sequencing and mapping technologies, and even longer-read sequencing, will assist in increasing knowledge on the evolutionary journey taken by the great apes and our human ancestors. The scientists caution that the ape genomes and their work on them are not yet complete because the genome assemblies are still missing other larger, more complex structural variations that cannot yet be assembled. "Our goal," said Eichler," is to generate multiple ape genomes with as high quality as the human genome. Only then will we be able to truly understand the genetic differences that make us uniquely human."